Martin Grams: They Call It "Free Comic Book Day"
They Call It "Free Comic Book Day"
His name was Joe Field, owner of Flying Colors Comics in Concord, California, a retail store selling comic books, tee shirts and action figures. The comic book industry was suffering from a financial drop in sales during the late 1990s and, inspired by a long line of customers standing outside Baskin Robbins waiting patiently to take advantage of the "free scoop tonight" promotion, wondered if the same thing could happen with his business. 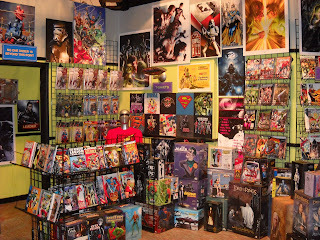 Writing a monthly column for an industry trade magazine, Field proposed Free Comic Book Day. In any business the question comes down to "How will I make money if I give away the product?" It was Field who proposed that non-comic book buyers would visit the store if they knew they could get something for free and... hopefully get hooked on an on-going storyline and pay repeat visits to the store. On May 4, 2002, the first event was held across the county. The new Spider-Man movie was about to be released in theaters and Marvel wanted to take advantage of the publicity by offering a free Spider-Man comic book that weekend. That tradition has been the strength of Free Comic Book Day ever since. From Iron Man to The Avengers to Captain America: Civil War, special issues have been printed and distributed to participating comic book stores across the country as tie-ins with the major motion pictures. Always held on the first weekend of May, you can look up the name and location of your nearest comic book store and pay them a visit Saturday morning. No strings attached, no purchase necessary. Some even have free pizza and celebrity comic book artists. With Guardians of the Galaxy Vol. 2 scheduled for release this weekend, I can see no reason why there would not be free issues of Guardians being offered. Behind the scenes, having asked retailers what the scoop was in the fine print, comic books given away on Free Comic Book Day are not free. Retailers have to pay between 12 and 50 cents per issue, depending on the issues. But retailers hope their investment pays off. One store near me has such a large turnout that Free Comic Book Day is guaranteed profit in the bank. Action figures, trade paperbacks, Christmas ornaments and costumes are taken off the shelf and purchased so quick that staff spends a good part of the afternoon restocking the shelves. As one retailer told me, "Dude, this store does better on Free Comic Book Day than Black Friday." 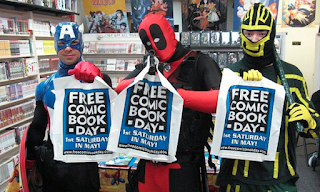 Of amusement is fans who dress up in costume for Free Comic Book Day. Cosplay has becoming the norm for comic cons and one of these cosplayers once told me, "I can gauge how good my costume is by the number of times people want to take a photo of me. If I do not get any photos taken today, I need a better costume."